The Clicgear Model 8.0 is unique. The design started with many requests for us to do a four wheel cart from our loyal customers. Most wanted to upgrade to something bigger and better from the Clicgear they already owned. The project started two years ago with the basics requirements and a long wish list of things we would like to do with the design. After two long years, we were finally happy with the design and started production on what will most likely be the benchmark for premium four wheel golf carts for a long time. Two major design improvements on four wheel cart design include dual front brakes and dual front wheel alignment. 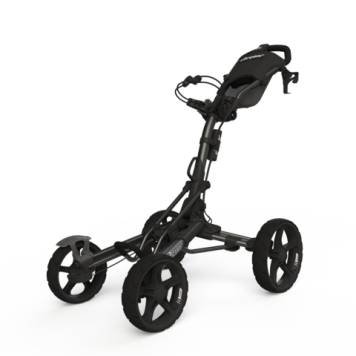 The dual front brakes allow for the cart to be quickly manoeuvred around the green with the brake on. The Dual front wheel alignment makes this the first four wheel cart that can actually be adjusted to do straight.